Designing web apps that are scalable is essential. 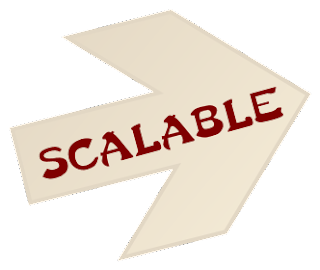 Thinking about scalability at the beginning of project allows the app to add only a few resources for handling higher loads without significant change. Contrastingly, a non scalable app would have to be extensively modified. Choosing the right web tool is important and most developers prefer open source and free tools. Some of the reasons for choosing the open source option are their powerful features, the fact that they are free, highly scalable and have good community support. Today, more and more developers are making use of open source projects for building highly scalable web applications because of the ease of availability and use. The Apache HTTP server is popular, highly scalable, extensible and fast. This software supports a wide variety of features and modules which enhance its core functionality. Additionally, it supports authentication of digital certificate as well as password and also contains a built in search engine. Its very easy to configure and has strong PHP modules available that can create decent web applications in very less effort. Tomcat web container is open source software, which is an implementation of java. Apache Tomcat includes management and configuration tools but you can also configure it through XML configuration files. This software can be used for implementing the JSP as well as java servlet specifications. Some people prefer to use Application servers like JBoss or Glassfish that come with more comprehensive features, however with use of Spring framework and many other open source libraries you can make really powerful and portable web applications. Modsecurity is a web application firewall which is embeddable within your present web server infrastructure. Besides providing logging facilities, Modsecurity provides real time monitoring of HTTP traffic for the detection of attacks. In addition to this, this software acts immediately to prevent your web applications from getting attacked, thus keeping them safe from getting damaged and corrupted. Modsecurity is leading open source WAF solution, however there are many other good open source waf alternatives to modsecurity. Varnish Cache is an HTTP reverse proxy also known as web application accelerator. Varnish Cache is very high speed software. Depending upon your architecture, it speeds up the process of delivery by a factor of almost 300-1000x. Varnish is usually associated with network speed, thus churning out effective performance. The Apache Thrift is a software framework which is meant for services development which are cross language and scalable. This software system uses a combination of code generation engine and software stack to build services which operate seamlessly and efficiently between languages like java, Python, Ruby, C++ and many more. MySQL is most popular open source relational database software written in C and C++ and works with a wide range of platforms. It makes use of server designs which are multi-layered with independent modules. It is designed with kernel threads which make it fully multi threaded so that it can easily be used with multiple CPUs. MySQL also comes with storage engines that are transactional as well as non-transactional and a high speed memory allocation system. PostgreSQL is a powerful database system which is open source in nature. This open source system is known for its proven architecture and active development because of which it has earned a reputation of being highly reliable and correct. It is compatible with all the major operating systems and is ACID compliant. Additionally, it is fully supported for foreign keys, views, joins, triggers, etc. If you are looking for high availability as well as scalability without compromising on performance, the Apache Cassandra database will be the right choice for you. This is one of the most perfect platforms for the purpose of mission critical data. This is made possible because of proven fault tolerance on cloud infrastructure and commodity hardware along with linear scalability. It also provides best in class replicating support across multiple datacenters, lower latency for users and protection against regional outages. MongoDB is a high performing and scalable open source database which is written in C++. It comes with document oriented storage with JSON style documents offering power and simplicity through dynamic schemes. In addition to this, you will also get full index support, auto sharding, replication and high availability, fast in-place updates through atomic modifiers, Querying, GridFS as well as Commercial Support. MongoDB and Cassandra are two of many Leading Free NOSQL databases available. Hazelcast is a highly scalable platform for data distribution as well as an open source clustering for Java. It is capable of performing thousands of operations within a second and is completely fail safe i.e. whenever there is a crash, none of your data will be lost. Hazelcast can dynamically scale itself on addition of new servers to its network and is extremely easy and user friendly. Additionally, some other features include elastic nature, distributed data structures, memcache support, distributed caching capabilities and much more. CoralCDN is a distribution network for open content which is available free of cost. It is based on peer to peer technologies and consists of a worldwide network of name servers and web proxies. With the help of CoralCDN, you will be able to run a high performing website which meets huge demand. This network refrains from giving rise to hot spots within its infrastructure. In case you do not want to use CoralCDN you can spin your own CDN using many other open source libraries or go for some affordable CDN options to start with. Selenium is the best way in which you can automate your functional testing on variety of browsers. The immense power that is generated can be used for a wide variety of purposes. Particularly, it is used for the automation of web applications for the purpose of testing. This is strong framework of tools which is compatible across different browsers. Just like real users, Selenium tests also run directly within a browser. The best thing about Selenium is that it supports testing on multiple operating systems and browsers. SoapUI has become one of the most popular functional testing tools for Web Service as well as SOA. It comes with a graphical interface which is pretty easy to use along with enterprise class features. With the help of SoapUI, you will be able to create and execute automated regression, functional and load tests, rapidly and easily. Within a single test environment, you can have access to complete testing coverage which includes rich internet applications, databases, SOAP and much more. For more than three decades, the domain of software development was completely dominated by the proprietary software. But in the current times, an alternative form of software development model has occupied a major proportion of the mind share and is called the open source. Here, the source code is available to the public at large along with free of charge modification. It is basically a collaborative effort wherein programmers make improvements to the code which is shared within the community. Hope you will find this list useful. Are you using other open source projects that are not listed here? Feel free to share with us. Here You have described wonderful tasks for creating highly efficient sites and web programs. These tasks are more useful for examining our web creating expertise. I was wondering for this information so far, many thanks for sharing it here!